Have I mentioned lately how much I love early mornings? I mean real early ~ like predawn early. I’m sure I’ve mentioned (just a few dozens of times) before how the windows in my room face east and how much I love watching the sun come up. I’ve probably also mentioned how I used to be more of a sunset person and how now I’ve become more of a sunrise person, although I love them both. I suppose as life changes and routines get rearranged, these are some of the things that gradually get reshaped too. Anyway, it’s a beautiful winter morning here. We had another snowstorm the other day and fresh snow always sets such a hush and quietness over everything, I love it. As I’m sitting here at the moment drinking my warm cup, the sun is just beginning to come up and the icy branches of my tree are glistening in the sunlight, it’s a dazzling sight and fills my heart with gratitude and hope. To me, the sunrise embodies hope. And new beginnings. Two things we all need. I know I do. I’ve had a rough few days here recently, filled with much worry and stress, but as this new day dawns and the light breaks through, I feel hopeful that today will be better. This entry was posted in Random Thoughts & Contemplations, Winter and tagged hope, Nature, Photography, winter. Bookmark the permalink. That image is stunning. Perfect. Thank you, I really appreciate that. And nice to have you here, thanks so much for stopping by! Gorgeous again, Jewels! 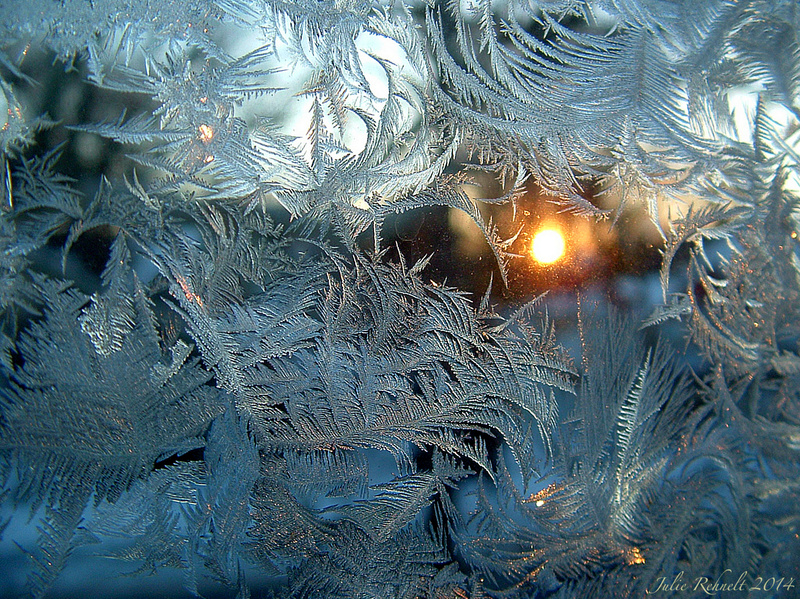 I’ve tried to photograph our window frosts, and I do not have your skill, or mine just aren’t as pretty, or somethin! I so enjoy yours! Julie. I share your love of sunrises. I have been waking friends on beach vacations to see the sunrise since I was a teen. Once my kids reached their teens we would stay up all night on New Year’s Eve to watch the sunrise on the first day of the New Year. Now I have started a tradition with my grandkids – taking each of them separately on a special sunrise picnic. It is truly such a peaceful and optimistic time of day. Hope that the day you wrote this turned out to be less stressful and more worry-free. I am such an admirer of your photography. It is absolutely beautiful. What a wonderful idea to stay up all night to watch the sun come up on the first day of the New Year, but I’m sort of a lightweight though when it comes to pulling all-nighters, I do love my sleep. 😉 And what a lovely tradition to now have special sunrise picnics with your grandkids. I agree… sunrise really is a peaceful and optimistic time of day. My day was much less stressful, thanks! And thank you so much, Jan, I really appreciate that and I’m so glad you like it. I’m no real photographer by any means, but I do so enjoy trying to capture beautiful things with my camera, especially things of nature, my greatest inspiration. Beautiful winter sunrise photo! I love to see sunrises as well. I only see them on clear winter days here (the rest of the year the sun rises behind a row of trees on the east side of my house and it’s usually cloudy anyway) so when I do get to see them it’s a rare treat. I hope today is a better day for you and that the stressful situation works out the way you wish. Take care! Hugs! Oh yes, most of the windows in our inside porch are south facing so I usually end up growing my herbs there. The only bad thing, in the summer my bedroom gets WAY too hot since it’s south facing, it’s horrific. Another beautiful sight is the snow glittering against the sun. I absolutely love sunny days in the winter for that reason. Beautiful, I love a sunrise as you say it brings a newness and hope to life, something we all need. I too have been dealing with a lot of stress and I find getting out with my camera on my own brings me a certain calmness. I love sunrises. I am up early most mornings my norm is 4-5:00 a.m. I have never been a late sleeper but I did use to get up around 6-7 LOL. I think the winter time is a tough time of year. We do not get the warmth of the sun as much and we have far to many dreary rainy days. My favorite time of the year is spring then summer and last early fall. They all offer something I like. Winter I freeze the entire time and we do not get snow here in our part of Texas. I prefer temperatures in the range of 70-75 I think those are ideal. 4:00 a.m? Wow, now that’s a bit too early for me! Even if I’m awake, I usually linger in bed as long as possible, but the desire for coffee has me up by 6 or 7. I do so love the quietness of mornings, before the rest of the world awakes. 🙂 Winters here do get long, but we have lots of bright sunny days and the blue of the sky amidst the white of the snow is so lovely. My spring fever will probably be kicking in soon though. 😉 My goal is always just to try to be content and find the beauty in each day. I’ve never been to Texas, I always think of it as being desert-like, I agree… 70-75 are ideal.